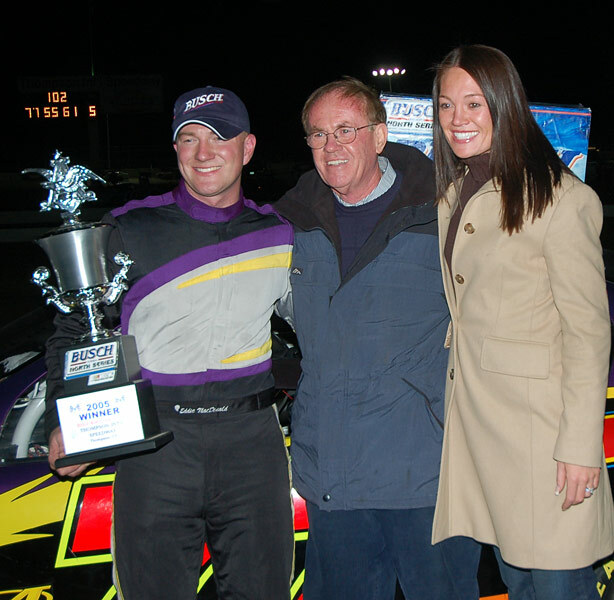 January 1, 2009 – (Waymart, PA) - The 2009 season is underway for Eddie MacDonald and Grimm Racing. 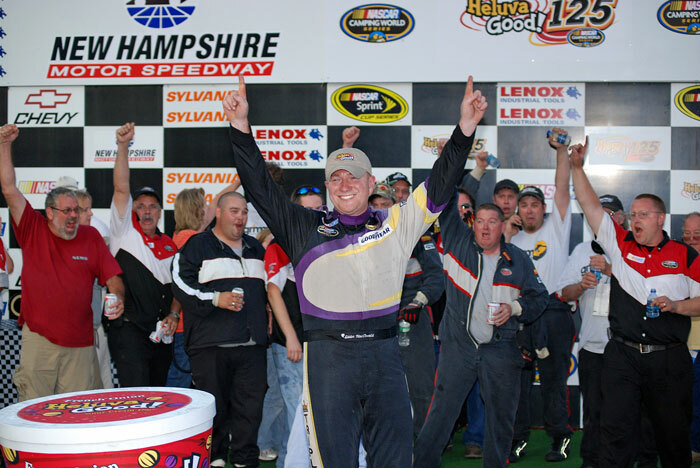 After a successful 2008 season, MacDonald capped off that season with the year end banquets for New Hampshire Motor Speedway and the NASCAR Camping World East Series Champions Banquet in December. 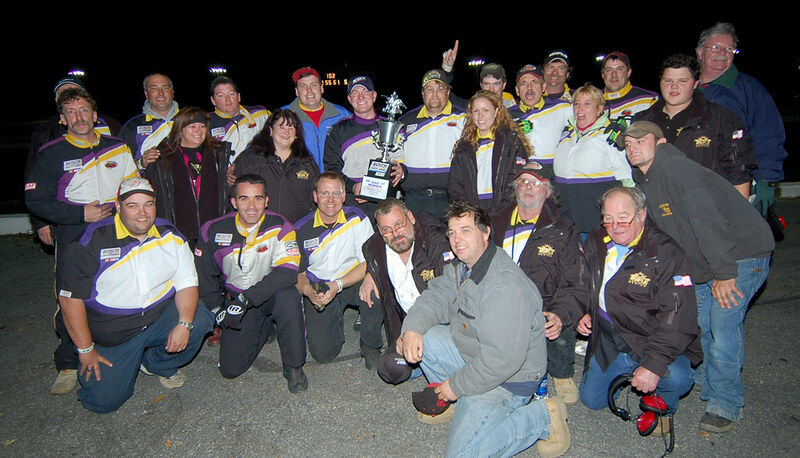 In Concord, NH MacDonald received the Lincoln Electric / Airgas Track Championship at the New Hampshire Motor Speedway holiday banquet. The following night at the Champions banquet at Mohegan Sun Resort, MacDonald picked up two additional honors with the POWERade Power Move of the Race Award and Featherlite Most Improved Driver Award in addition to his 7th place season honors. 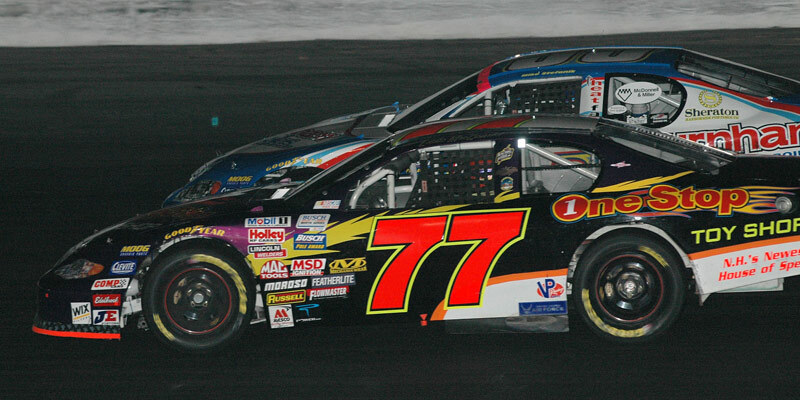 Now that 2009 is officially here the Grimm Racing team is busy putting their final preparations on the two cars (“Cupcake” and “Mackey”) that they will be transporting cross country from their Newbury, MA and Waymart PA race shops to Irwindale, CA. “Cupcake” has been cross country twice before for the Toyota All-Star Showdown finishing 5th last year and “Mackey” is the newest car in the stable at Grimm Racing. “Mackey” is named after crewmember Robert “Mackey” McNamara who was with Eddie last year at Irwindale but died unexpected a few weeks after the team’s return in 2007. Mackey will be the primary car when MacDonald and crew chief, Rollie Lachance return to Irwindale with hopes of meeting another goal for themselves and team owner Rob Grimm. Upon the team’s return from CA they will continue their preparation for 2009. Grimm Racing is committed to running the full season in the NASCAR Camping World East Series starting at the season opener in Greenville, SC. Prior to the season opener the Grimm Racing #71 Chevy will be making an appearance at the Speedway EXPO in Springfield, MA on Feb 27 through March 1st. The team operations will continue to be the same as the 2008 with two race shop preparing the cars throughout the season. Grimm Racing continues to look for a primary sponsorship while continuing to enjoy their current sponsor relations with Grimm Construction, New England Mechanical Overlay - NEMO, Waymart Building Center, R.B. Fries Pontiac Buick GMC, A&B Vending, D.E.G. Services “Motorsports TY-RAP Source” and Dirlam Lumber. For more information about Grimm Racing contact Rob Grimm or Paul Madden at 570-488-9700. DAYTONA, Fla. (Dec. 15, 2007) – The National Association for Stock Car Auto Racing (NASCAR) announced today that Camping World, the country’s largest RV and outdoor retailer, will become the title sponsor for NASCAR Camping World Series beginning in 2008, entitling NASCAR’s top developmental series – the long-standing Grand National Division, East and West Series. 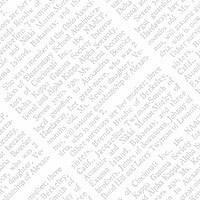 Over the years, this series has helped launch the careers of many future NASCAR stars, including current NASCAR Sprint Cup Series standouts Kevin Harvick, Martin Truex, Jr., and David Gilliland, along with two-time championship crew chief Greg Zipadelli. As the new title sponsor, Camping World looks to continue the tradition of developing talented young drivers that aspire to go on and excel in the highest levels of NASCAR racing. Recent enhancements to the series included a schedule with an expanded geographic reach, new competition and cost-containment initiatives such as the new “spec engine” and composite body, and a lowered age-limit to 16 for drivers. The NASCAR Camping World Series features cars similar in design and appearance to those cars competing in the NASCAR Nationwide Series. The East Series races in key markets in the northeast, along the Atlantic seaboard, and as far west as Iowa. The West Series features events along the Pacific coast, and several western states, reaching as far east as Iowa, where the two separate series meet for a combined event in May. 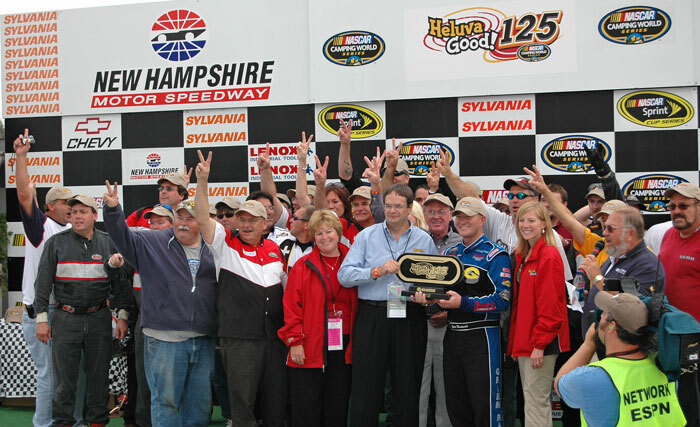 Both series run at a challenging combination of short tracks, intermediates, road courses, and speedways, with a number of races held in combination with NASCAR Sprint Cup Series events. Camping World currently has extensive involvement in the NASCAR Nationwide Series. It has a primary sponsorship relationship with Kevin Harvick Inc., the race team owned by the former West Series champion and current NASCAR Sprint Cup Series star. Camping World’s sponsorship with KHI includes primary sponsorship for NASCAR Nationwide Series entries, as well as 19 races as primary sponsor for the 2007 NASCAR Craftsman Truck Series champion Ron Hornaday Jr., a former West Series runner-up. "Camping World has done a great job raising the level of awareness of their brand through their involvement with their NASCAR sponsorships,” Harvick said. “Fans in RVs travel hundreds of thousands of miles each year to attend races all over the country and they are certainly passionate about the sport of racing. I think it's a natural fit." In addition, Camping World has a primary NASCAR Nationwide Series sponsorship relationship with Richard Childress Racing, and race sponsorship with three NASCAR Nationwide Series events (Daytona, New Hampshire and California). 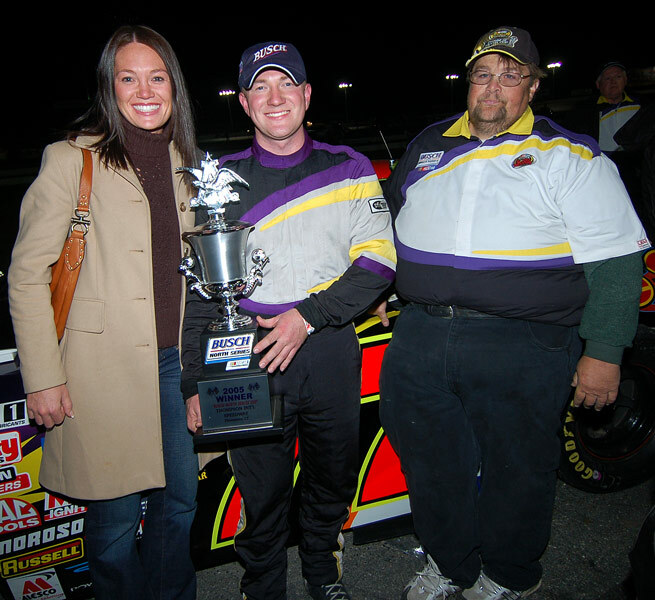 Stafford Springs, Conn. — Former series regular Eddie MacDonald made his first NASCAR Grand National Division, Busch East Series start of the season Friday night. And he came away with his first victory since 2005. 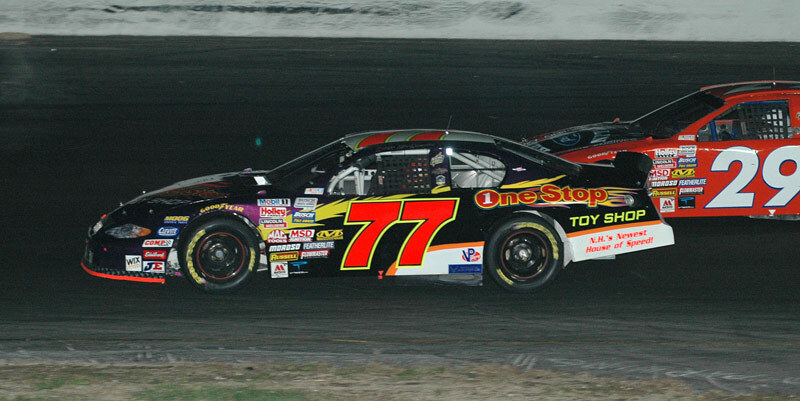 MacDonald led the final 81 laps of the TSI Harley Davidson 150 at Stafford Motor Speedway. His win also earned him a secured starting spot in the postseason Toyota All-Star Challenge. 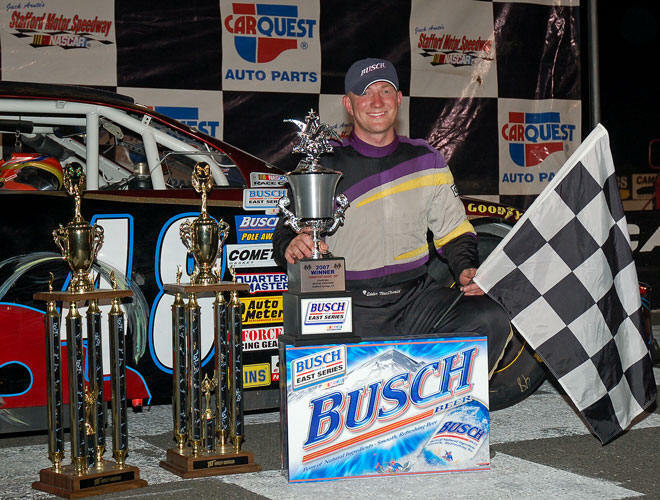 Eddie MacDonald dominated the field for his first win of the season in the final regular Busch North Series race at Thompson International Speedway. After starting on the outside pole, The One Stop Toy Shop Chevy led all but eight laps and had to outmuscle Mike Stefanik on a green-white-checkered restart to earn the trip to Victory Lane.